Once synced, the written information is combined with the original document and can be shared via PDF. The included software allows you to manage the documents, and there is also the ability to interface with other systems. 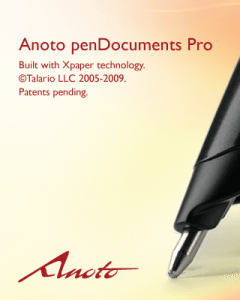 Anoto is a Swedish company and developed the technology behind products like the Livescribe Pen and the Logitech Io2 pen. I am a big fan of my Livescribe pen so I was very interested in looking at this technology. Since my day job is writing training and reference materials I thought this would be a very interesting solution for document review. Little did I know how much more there is to this product. This is not the typical Gadgeteer item. This product is geared more to vertical markets than something you would go down to your corner Best Buy to purchase. Out of the box, it does some impressive things, but as part of a system it really shines. 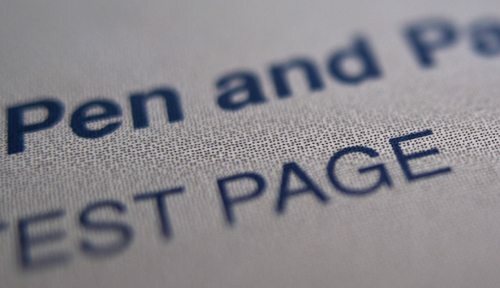 The pattern gives the printed document a light-gray background. Unless you look real close, you probably wouldn’t even notice the pattern. The camera in the pen, however, uses this pattern to record your pen strokes and identify the unique document page you are working on. The pen is very similar to my Livescribe pen, with a number of notable improvements. Here is a shot of them side by side. The Livescribe is on the right. Sometimes it’s the little things that stand out in a gadget. The pen has an elliptical cross-section that prevents it from rolling off the table (unlike my beloved Livescribe). It also comes with two caps. Having a backup is helpful, because there is no on and off switch. If the cap is off, the pen is automatically on. Given the vertical markets this pen is used for (medical and others) this is an excellent design. I have experienced frustration on multiple occasions when I discovered too late that I had forgotten to turn on my Livescribe. 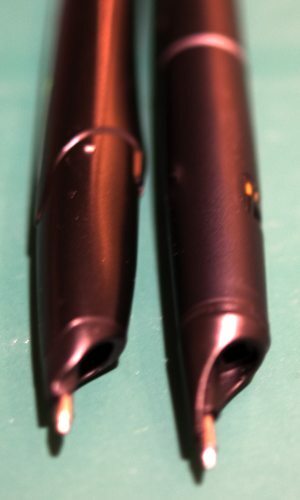 You can see that the pen tips of both pens are similar. The design allows for the small camera used to record the pen strokes. 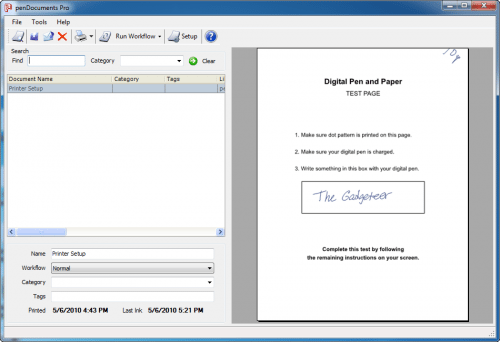 The penDocuments Pro package consists of two software components. The penDirector application manages the transfer of information to your computer and the penDocuments software manages the documents produced. Both applications are Windows-only and worked fine in Windows XP and Window 7. This application runs in your system tray. If your pen is docked, you can hover over the icon to see the status of your pen. This includes charge level as well as the estimated write and standby time. When you dock your pen, the penDirector automatically downloads any information currently on the pen and clears the memory of the pen by default. You can change this, but there is really no reason to leave the data on the pen. I have a Canon MX860. It is color, but is not a PostScript printer. I was able to set it up fine. However, if this was a solution I was going to implement, I would look into a PostScript color laser. Once you have set up the application and a printer, you can create a new document by printing in Windows to the Anoto Print driver. This outputs the document with the required dot pattern and adds it to the penDocuments library. You can also do a quick print of standard documents. Initially you have the option of a grid printout, lined page printout, or 20 page “notebook” of either. If you have common forms you use a lot, you can add them to your Quick Print list. For example, if you are a property management company, you can print the standard rental agreement, add it to your quick print list and now you can print it out with a few quick clicks. Documents stored in the application have names as well as categories and tags you can assign to them. In addition, meta data is stored including date and time of last update as well as what pen updated the document. But this system goes way beyond simply recording your penstokes to one PC. It is designed to be scalable with the use of various connectors to other systems and the ability to define workflows. 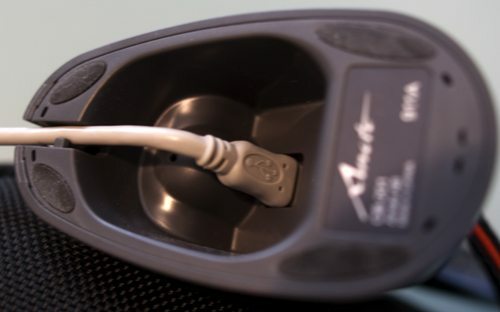 Connectors are add-ins that leverage the information you enter with the pen. These include connectors to multiple versions of Outlook, SharePoint, Nuance eCopy PaperWorks, Projectplace, as well as a generic HTTP connector. In addition there are tools and information to create custom connectors. You can define workflows for your documents that define what application is launched. The pen also supports bluetooth. You need to enable the mobile option when printing the document (it adds a checkbox). Once paired, you can submit your information by checking a printed box on the form. Anoto has a number of helpful videos explaining their products, but they disable embedding, so I cannot provide them here. You can go to YouTube to view an 8 minute pitch on penDocuments as well as their intriguing product penPresenter, which uses the same technology to let you control and annotate a running PowerPoint presentation with a digital pen and slide print outs. To see an example of an implemented solution, I highly recommend the 2-minute look at Safelite. Also, if this sounds like a good solution for you, Anoto has a number of other case studies on their site. 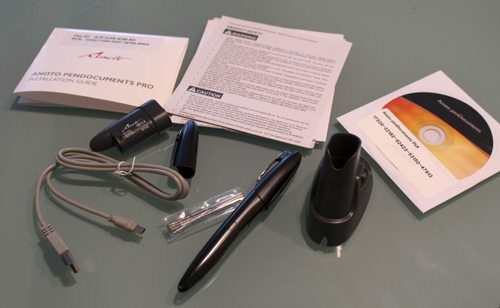 The package is $499 for the pen, software, and license. You can add additional pens to the setup, but that will require additional licenses. The pen is available through resellers, and there are opportunities for discounts for multiple purchases. I have worked on a number of projects involving collecting data in the field, and I can say this is a very competitive product. 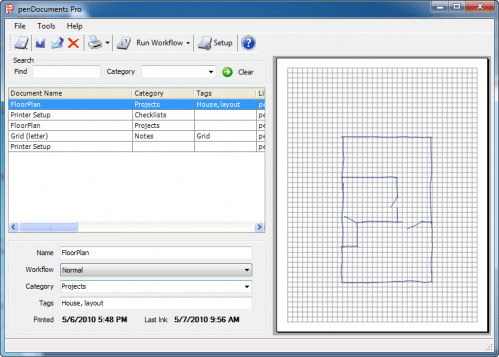 The interface is basically pen and paper (bad for folks like me who make a living training others) and the availability of connectors to popular systems as well as the ability to create your own makes this a very versatile product. If you need a system to collect and manage data, this is a great solution. With the proper work in setting up the software on a PC, Anoto penDocuments serves as a seamless interface to a potentially sophisticated system. All the user of the pen needs to know is how to write on the prepared paper. They don’t even have to think about making sure the pen is on. Once they dock the pen (or check the transmit box if they are using bluetooth) they are done. I really like the underlying technology. This is not a good solution for me (I am an independent instructional designer) but would be a worthwhile investment for a larger organization, especially if they needed to collaborate remotely with multiple people. I also imagine it works very well in large healthcare implementations (it is deployed in a number of them now) as well as other areas where you want to quickly share information. Essentially, the printed document can remain as a backup while the information is quickly shared electronically. It is an expensive solution, but for the right situation is a great value. Very good and thorough review. 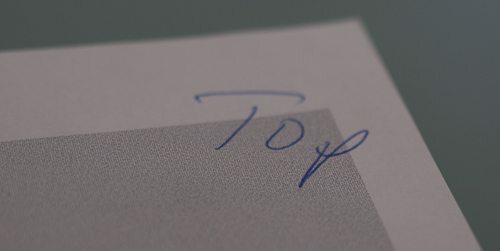 Important points about enterprise applications and verticals – I have found field forces ranging from power and energy to manufacturing (including China) to financial services (think insurance and micro financing in developing markets) to supply chain to government to healthcare and more benefit from Anoto technology. Personally I have used the same digital pen for my notes – paired via Bluetooth with my mobile device – since April 2006. All of my notes, which can be quite ‘graphical’ with work flow diagrams, etc. are easily stored, searched and shared. Can it capture sound like the livescribe smartpen does? Does is ahve an app-store as the livescribe smartpen does? Note: In Livescribe’s app-store I’ve tested the Swissknife app (winner of productivity category). it’s pretty amazing. I love the multi-stopwatch. No. This is designed more as a data entry tool for hand-writing. The star of the show is the software on the PC and its hooks into other systems. The pen does have Bluetooth, which is an upgrade from the Livescribe, but the innovation with this tool is on the PC side, not the pen itself. Thanks for an insightful and thorough review! We´ll take a look at the possibility to enable embedding the videos from our YouTube channel. Please do not hesitate to contact me for more info. You’re right that the Anoto technology is great for larger organizations with mobile teams collecting data and collaborating. Our Capturx software seamlessly integrates Anoto’s digital pen and paper technology into Microsoft Office and SharePoint – so teams can collect unstructured notes into Office OneNote and structured forms data into Excel and SharePoint. Judging by your review, this device could be very useful for me. Unfortunately, their website is devoid of useful information — it’s full of marketing BS! There isn’t even a “Buy Now” button. To add insult to injury, clicking on “Find a Solution Provider. ” gives a 404 error. Brilliant! You can purchase the penDocument Pro from Fairmont Technology Solutions which is an authorized reseller for Anoto. http://www.fairmonttechnology.com or you can purchase it on Amazon.com, search Anoto or pendocuments. All Amazon orders are routed to Fairmont Technology Solutions. Hi, can someone please help. I have an Anoto CB-201 but I have lost my driver CD, and have put a fresh install of windows etc on my laptop, I am unable to locate the CD and in fact cannot find drivers online?? Anyone have any ideas that could help?? Sorry to resurrect this older post. Since you had in your possession both your Livescribe and the DP-201, did you check to see if the notebooks/paper for the Livescribe worked for the DP-210? I have a Adapx/Capturx DP-210 and would like to find bound notebooks less expensive than the Rite in the rain pads. Awesome review. Thanks. I came to this article after evaluating to purchase the AutoDesk Sketchbook application that in some sense allows the user to draw with the tablet and pen. I want to draw hand drawn diagrams in PowerPoint and this device seems to allow it.